Jamaica will become the first Caribbean team to play in a senior FIFA Women’s World Cup, after the “Reggae Girlz” edged Panama via kicks from the penalty mark tonight in the third place play off of the 2018 Concacaf Women’s Championship. 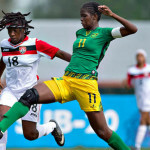 The result earned Jamaica the right to participate at the France 2019 Women’s World Cup. Photo: The Jamaica Women’s National Senior Team compete at the 2018 Concacaf Women’s Championship. In a neat symmetry, the Jamaican women matched their male counterparts who became the first member of the English speaking Caribbean to play in a senior FIFA World Cup—20 years ago—when they participated at the France 1998 tournament. The Reggae Girlz’ success comes on the heels of Haiti’s qualification for the France 2018 Under-20 Women’s World Cup. Ironically, Haiti were first to represent the Caribbean in a men’s FIFA tournament too, as they controversially qualified for the West Germany 1974 World Cup at the expense of Trinidad and Tobago. The two island republic waited 32 years before the Soca Warriors booked their place at the Germany 2006 World Cup. 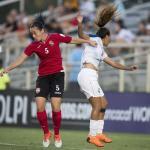 Trinidad and Tobago came within a whisker of the Canada 2015 Women’s World Cup but lost the third place play off to Mexico and were beaten by Ecuador in a FIFA Play Off. 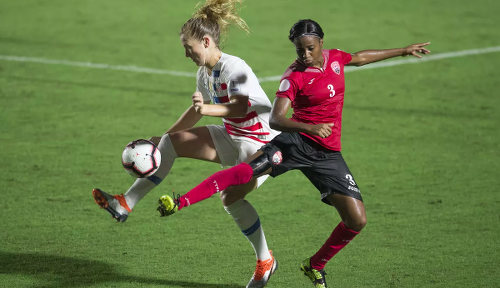 The Women Soca Warriors, who finished second to Jamaica in the 2018 Caribbean Championship, failed to get a single point at the Concacaf stage this year, as they conceded 14 times and scored just once in three group matches. Neither Jamaica nor Panama had ever qualified for a FIFA Women’s World Cup tournament at kick off. 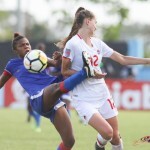 Twice, Jamaica led through the gifted Khadija “Bunny” Shaw and 16 year old Jody Brown, only for the Central Americans to equalise through captain Natalia Mills and Lineth Cedeno. 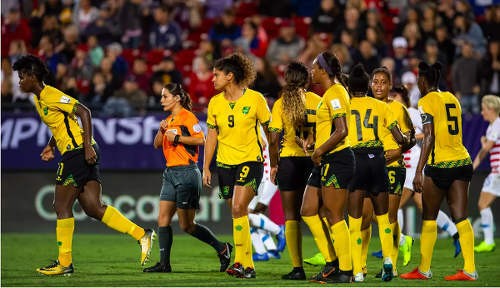 However, Jamaica prevailed in the shootout, as Deneisha Blackwood, Ashleigh Shim, Christina Chang and Dominique Bond-Flasza converted to make history for the Reggae Girlz. Hosts United States defeated Canada 2-0 to retain their Concacaf title. Both nations had already qualified for the France World Cup before kick off.